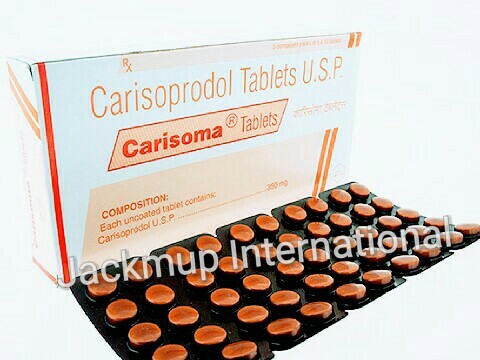 Description:- Carisoma 350 mg tablet is used for muscle relaxation.It works by acting on the centers in the brain and spinal cord to relieve the muscle stiffness or spasm. Do not take carisoprodol for longer than prescribed period as it may lead to drug dependence and withdrawal symptoms when discontinued. Consult your doctor if you have a history of fits (seizures), liver or kidney disease. Do not drive or operate machinery while taking carisoprodol as it known to cause dizziness and sedation. Do not consume alcohol while on carisoprodol treatment as it may worsen the side effects. Side Effects:- Nausea, Blurred vision, Convulsion, Dizziness, Drowsiness, Headache, Lethargy, Stomach upset, Tachycardia, Vertigo, Vomiting.